We spent over 25 hours researching and testing 16 different types of baby soap and found that ingredients, performance, and all natural properties were most important. The Earth Mama Baby Wash scored high marks in every category and is our top pick. It is 99.9% natural and contains no petrolatum, SLS, phthalates, or parabens. It is pediatrician approved as well. Each bottle contains 34 fl oz. It is so gentle that using it every day never caused a problem with the baby’s skin. It is designed to nurture and hydrate your baby’s skin. There are hundreds of options on the market for bathing your baby. Finding good baby soap is very important for many reasons. Baby’s skin is super sensitive so you need to make sure that the products you use on their skin will not cause it to become dry, irritated or develop rashes. The top rated baby soaps that we are reviewing below are very popular with customers because they provide many benefits to their baby’s skin. The purpose of baby soap is to get your baby clean without causing problems for the baby in terms of irritation by using a product with harsh chemicals that are not good for them. Read below to make sure that you are choosing a baby soap that will be the right type to use for your baby and their particular skin type and issues if there are any. With a name like Earth Mama, how can this soap be anything but perfect for your baby? This safe and gentle baby soap is a versatile liquid castile soap that can be used to wash your entire baby from the hair on their head to their little toes. It’s not just safe for babies; everyone in the house can use this soap safely. 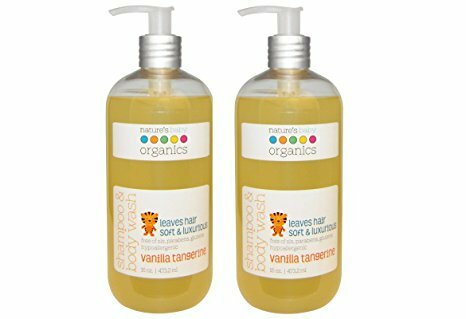 It is made of ingredients including soothing organic Calendula, organic vanilla and sweet orange essential oil for a lovely fragrance that is soothing as well. This baby soap is so safe and gentle; it is becoming very popular in hospitals for use in giving newborns their very first bath. There are no synthetic fragrances, foaming agents, sulfates, preservatives or parabens in Earth Mama Baby Body Wash and Shampoo. This shampoo is also detergent-free and non-toxic so you don’t have to worry about your baby breaking out with rashes from using it. Another benefit to this terrific and wonderful smelling baby soap is that it is economical as well. Parents will get over 300 pumps from this 5.3 ounce bottle. This gentle, all natural baby soap was formulated by a nurse and herbalist and is recommended by hospitals. It is naturally vegan and gluten-free as well. Because this is an all natural castile soap, you will need to be mindful of your baby’s eyes if you use it to wash their hair. For best results, use this baby soap with the self-foaming bottle. Start your baby off with a product that will nurture their skin rather than stress and irritate it. Nature’s Baby Organics Baby Wash is 100% natural and is USDA Certified Organic. It does not have the typical damaging chemicals that most baby soaps and shampoos have. The combination of these ingredients cleanse, moisturize, nourish and even strengthen your baby’s skin; very important for a newborn. These ingredients are also proven to reduce inflammation, soothe itching and pain that conditions like eczema, cradle cap, hives, rashes, diaper rash and other skin ailments can cause a baby. Many of the regular ingredients that are found in regular baby soap contain ingredients that can cause chronic skin conditions including over drying of the skin, eczema and others. Avoiding these harsh ingredients can protect your baby from having to deal with unpleasant skin problems. Burt’s Bees is a widely known brand in skin care and other health and beauty products. 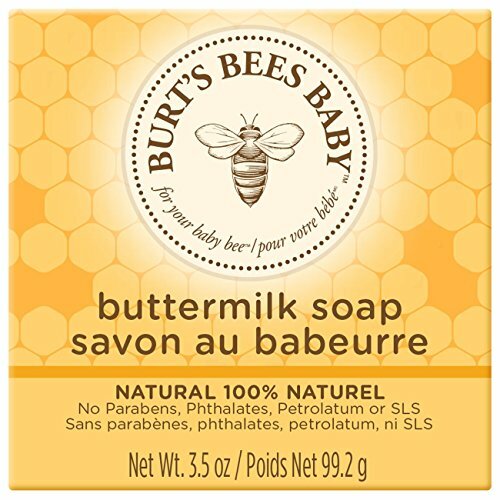 Burt’s Bees Baby Bee Buttermilk Soap is a very luxurious feeling soap that will gently clean your baby. Your baby will be super clean and their skin will be super soft and smooth too. Baby Bee Buttermilk Soap is 99.9% natural. There are no phthalates, parabens, petrolatum, or SLS and has been pediatrician-tested which provides peace of mind for the parents. Your baby’s skin will be nurtured by using this soap rather than dried out and irritated. When you first bring your baby home, you worry about doing the right things and not causing any discomfort to your baby by using products that can cause problems. Baby Bee is the perfect solution. The all natural ingredients take care of your baby’s skin which is 20 to 30 percent thinner than adult skin. It absorbs the ingredients that are used on it so parents must be careful to use the right ingredients. Each bar of soap weighs 3.5 ounces and is gentle enough to be used every day with no adverse effects. With ingredients such as buttermilk for moisture, beeswax to lock in that moisture, Shea butter to soften dry skin, aloe to soothe and coconut oil to take care of sensitive skin, your baby will be protected from head to toe. Do you baby a favor and get this excellent and gentle soap from Burt’s Bees. You will love what it does for your baby’s skin so much you may decide to use it yourself. One of the most important practices to get into when it comes to the products that you use on your baby’s skin is reading the ingredients list. Knowing what you are using on your baby’s skin is probably the first and most important step in preventing skin problems later on. The top rated baby soaps that we have featured are all parent favorites because of the all natural, safe ingredients used and the benefits they provide to the baby’s skin. You will love how soft and healthy your baby’s skin is from using any one of these top rated choices. Does your baby need special baby soap? Regular products that adults use can damage a baby’s delicate and thinner skin. You want to find products that have been created specifically for babies’ needs and delicate skin. Baby skin is prone to drying out much quicker than an adult’s skin. The purpose of baby soap is to cleanse the skin mildly, without drying and irritating it and while protecting the natural balance as well. The perfumes, soaps and alcohols that are a regular part of the ingredient list in adult products can cause allergic reactions and even chronic skin conditions when used on a baby. The majority of products that are created especially for babies almost never have those harsh ingredients in them. The purpose of this guide is to help you choose the right baby soap for your baby so you can wash them with peace of mind that you are using a product that will nourish and improve the health of their skin rather than harm it. Look for baby soaps that state they are mild and made for babies but don’t stop there. Just because the product is made for babies doesn’t mean that it is always free of chemical ingredients. Be cautious about what products you use. Look at active ingredients, read reviews, and pay attention to the brand of the product as well. If there is a history of skin problems in the baby’s family, it is likely that there may be some hereditary skin problems. Proceed with care, assuming that the baby may have some of the same conditions. Look for all natural, mild baby soaps that will moisturize and nourish the skin. Also look for products that list all of the ingredients that they use in their soap. This way you will know what you are putting on your baby’s skin in case there are any reactions. Some of the terminology may be a bit foreign when it comes to reading those ingredient labels so we have listed a few of the more important and common ones below. pH Balanced – The pH scale is the way that acidity or alkaline properties are measured. If the pH is 1 to 6 this is an acidic substance. Higher scores, pH 8 to pH 14 for example, indicate that the substance is more alkaline. If the product is neither one it will be called pH neutral or pH7. A baby’s skin starts off as pH neutral and then turns slightly acidic within a few weeks of birth. Most products don’t give the pH levels, so they way that you can tell that the pH level is correct is by the reaction of the baby’s skin. If the skin is not dry or flaky than the product is a close match to the baby’s natural pH level. Alcohol Free – Alcohol is a common ingredient used in many adult products. This ingredient makes them dry quickly and is usually very light on the skin. It can cause drying on adult skin so imagine what it can do on a baby’s delicate skin. If there is alcohol in the baby soap you are considering, you will see it listed as ethanol or ethyl alcohol. If the ingredient says fatty alcohol, this usually won’t have the same drying effect. A common fatty alcohol is called Cetearyl alcohol. This is an ingredient that is often found in baby wipes. Cetostearyl alcohol is another form of fatty alcohol but a baby that has exceptionally sensitive skin may still have adverse reactions to it. Fragrance Free – Fragrance is what makes the products you use smell so good, but these ingredients can cause all kinds of problems for a baby’s sensitive skin. Baby products are usually either fragrance free or have natural fragrances that don’t typically cause irritations. If the baby’s skin isn’t excessively sensitive, they can probably handle mildly fragranced products. Just make sure they are pH neutral. Anti-Bacterial – The term antibacterial or antimicrobial means that bacteria are destroyed or the growth of bacteria is inhibited. Ingredients used to make a product anti-bacterial are not products that should be used on your baby. Alcohol free wipes or mild baby soap is more than sufficient enough to get your baby clean. Dermatologist Tested – This usually means that the product was tested on the skin. Although the tests don’t have to be conducted by a doctor or dermatologist, they must be checked afterwards by a medically qualified person to get this term used on the label or description. Hypoallergenic – These products are much less likely to cause any kind of allergic reaction in the user. For Sensitive Skin – This term is used for products that have ingredients that are less likely to cause skin irritations and rashes. It doesn’t mean that everyone who uses it will not have a reaction because everyone is different, but overall, the ingredients used are mild enough to not cause problems in the majority of users. Natural – This term means that the ingredient or ingredients that are labeled natural are derived or obtained from nature rather than chemically manufactured. Not all natural substances are safe, so still look at what they are before making a determination. Organic – The Soil Association states that products are deemed organic if more than 95% of their ingredients are made organically. pH Neutral – This means that the product is neither acidic nor alkaline and will usually have a pH level of 7. Preservatives – These are ingredients that are used to preserve and protect the product as well as the user from any germs that are present during the storage and use of different products. Preservatives usually make a product last longer as well. Formulated for Baby – This term means that the product you are looking at was created with the specific needs of a baby in mind. This will usually include removing harsh chemical ingredients, using all natural or organic ingredients, and will address the needs of a baby’s skin. What information will you find on the product label? If you’ve ever gotten shampoo or soap in your eyes, you know how badly that csn burn. The same thing can happen to a baby if you use products that are not mild enough or tear free. Some of the all natural products can still irritate the eyes so the better and safer thing to do is just avoid getting baby soap into the eyes at all if possible. Burning eyes don’t feel good and it can cause the baby to become afraid of taking a bath if they think their eyes will hurt every time they take one. If you are a new parent wanting to do the best you can to provide the safest products for your baby, there is nothing wrong with asking your baby’s doctor or the pediatrician who looks at your baby before you come home from the hospital, what type of products they recommend you use for your baby including baby soap. They will tell you what they recommend that will be the right type of product for your baby. They will also be able to recommend what baby soaps you should progress to as your baby gets older. If your baby shows any signs of skin problems, they will be able to tell you what types of baby soap to use that won’t aggravate the condition and make it worse. If bath time is handled correctly with comfortable water and baby soap that doesn’t burn their eyes or irritate their skin, your baby will probably love taking a bath. It can be a fun, relaxing time that transitions them into the bedtime stage very gently. With all of the different baby soaps on the market, you will be able to find one that will work for your little one. If you find several you like and can’t choose among the scents they offer, you can always try different ones to see which you prefer when actually using them. Most baby soaps can be used to wash the hair as well, so they end up being a one stop shop for bath time that is very convenient as well.